Microinsurance in Asia and Oceania is growing fast. A number of governments such as India, Indonesia and the Philippines have started developing a regulatory framework to facilitate the development of innovative solutions. As more and more stakeholders see the potential of microinsurance for the insurance industry and for economic development in the region, the demand for detailed data on the status of microinsurance grows. Although informal and community-based insurances have existed for a long time, the history of formal insurance provision is relatively young in Asia and Oceania. The study follows the same methodology as the Africa and Latinamerica landscape studies, comprising: secondary research (regulation, microinsurance scenarios, etc. ), primary research with providers in each market via phone interviews, interviews with experts in all markets. 1,264 organisations were approached in 53 Asian countries. Primary data collection took place between April to August 2013. Higher number of covered people, but lower in terms of coverage. In 2012, Asia covered 170.4 million low-income people. Compared to other regions like Africa (4.4%) or Latinamerica (7.6%), coverage in Asia reaches 4.3% which presents a much higher absolute number. 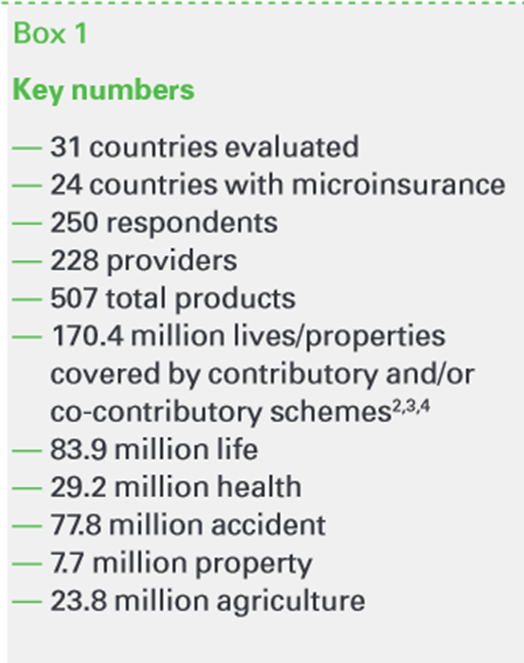 The microinsurance industry in Asia and Oceania keeps on rising, with compound annual growth rates of 30 % (for number of people covered) and 47 % (for premiums generated) between 2010 and 2012. India is leading the way in terms of microinsurance outreach. With 111.1 million people covered, India is home to 65.2% of the people covered in Asia and Oceania. The Indian microinsurance sector also generates 66% of the premiums on the continent. Due to its massive market size, India contributes to 72% of the growth in coverage and 80% of growth in premiums in the region. But again we find the discrepancy between coverage and absolute number of policy-holders: Indian microinsurance sector has so far been able to cover only 9% of the overall population and 14.7 % of the potential microinsurance market size in the country. In comparison, the microinsurance markets in the Philippines and Thailand are found to be more vibrant with a coverage ratio of 20.6% and 13.9% respectively. Some markets are growing very quickly and should definitely be watched. Malaysia and Mongolia are important to note here, since they registered a more than 50% annual growth rate both in terms of coverage and premium in the last two years. Indonesia, Fiji, China and Nepal are other countries with a high growth ratio in coverage, while Sri Lanka, Cambodia and Pakistan have attained high (>50 %) annual premium growth over the last two years. In total, ten of the top outreach countries cover approximately 99% of total microinsurance coverage in Asia and Oceania. Life insurance at the top of policies sold in Asia. A total of 507 microinsurance products were identified by the landscape study at the end of 2012. Of all products, life insurance is the flagship of microinsurance in Asia and Oceania. It records the highest outreach, both in terms of people covered and number of policies in force (83.9 million and 33.8 million respectively). 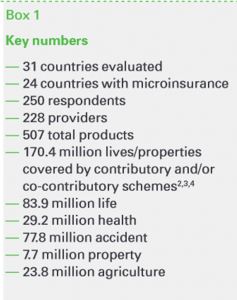 Health and agricultural microinsurance, however, are rapidly growing product types at a compounded annual growth rate of 131.8% and 67.3% respectively. Regulatory frameworks develop quickly in Asia. India and the Philippines have pioneered by formulating first-ever microinsurance-specific regulations for their insurance industries. Vietnam and Cambodia also have some form of microinsurance regulation in place. Bangladesh, China, Indonesia, Pakistan and Sri Lanka were also seen to formulate their first-ever microinsurance-specific regulation last year. The Indian and Filipino regulations have attained some form of maturity, while regulators in countries such as China, Bangladesh, Pakistan and Indonesia are tryingto promote their microinsurance sector by allowing newer entities into the sector, obliging commercial insurers to offer microinsurance,or by providing them additional benefits if they enter the sector. The regulatory and political environment of microinsurance is still in inception in countries such as Mongolia andLaos, where governments run their own microinsurance pilot projects and programmes. In some other countries, such as Thailand, Malaysia and Sri Lanka, the microinsurance sector hasgerminated under the aegis of their general insurance and/or microfinance regulations. Commercial insurers lead the way. Although in Asia, microinsurance mainly developed from community-initiated schemes, regulated commercial insurers currently lead the sector. At present, commercial insurers have the largest outreach in each and every product type. 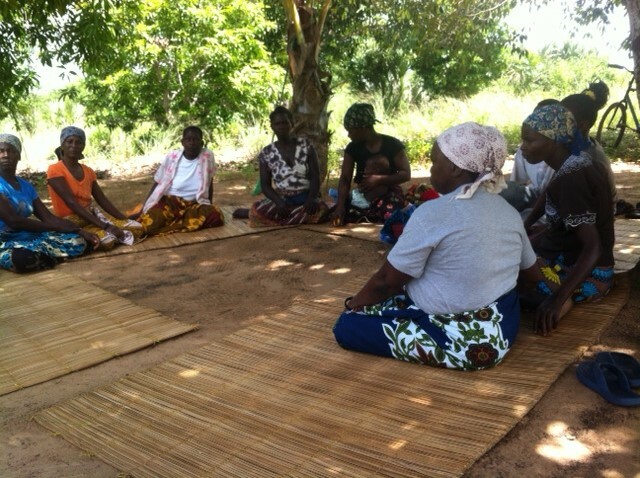 They are followed by NGOs, CBOs, mutuals and cooperatives. Most of these providers appear to be optimistic for the future and are planning for substantial growth in the years to come. 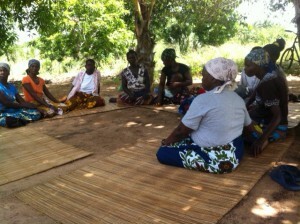 Innovatitve set ups of social microinsurance schemes. Twelve Asian countries have 23 different government-run social microinsurance programmes – mainly health and agriculture – serving approximately 1.7 billion individuals. These schemes are similar to conventional microinsurance and traditional social security schemes. The difference lies in the fact that the risk is underwritten and borne by commercial insurance companies, while the government contributes towards the premium amount. These are important schemes given the fact that they often target, and deliver free insurance services to, the potential market of microinsurance. 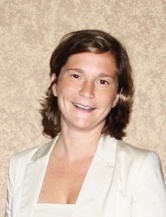 This entry was posted in Allgemein and tagged Asia, Microinsurance. Bookmark the permalink.